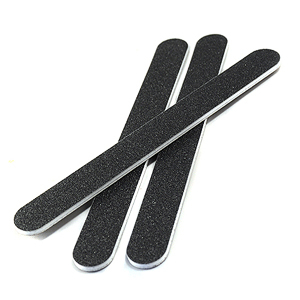 Black 180/180 (Medium/Medium) washable cushion nail files specially designed for professionals or home use. Standard nail files are completely water resistant (up to 5 minutes of immersion) and will not swell, shred or peel apart. They can be immersed in (or saturated with) 70-90% isopropyl or ethyl alcohol for 5 minutes.abrasive paper sourced from around the world to produce the highest quality and longest lasting nail file.